Hot rolled steel sheet pile forms its shape from the molten iron. The usual finish is mill finish, which is light scale on small stuff and heavy scale on thick stuff. With interlocks at both ends, more sections form a continuous sheet piling wall, which is a rigid barrier for earth and water, resisting the lateral pressures. 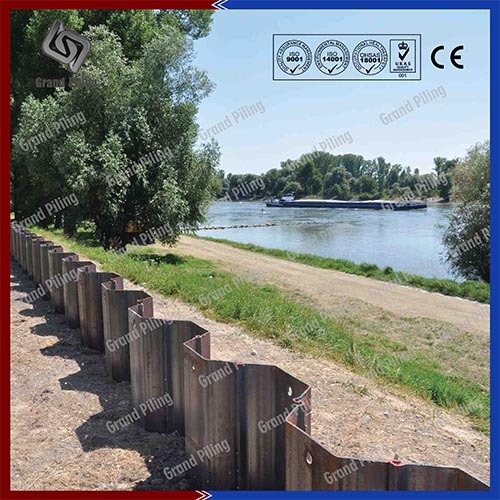 Sheet pile wall provide excellent resistances to bending forces and structural strength to deep foundation.Wide range of sections forming several series with various geometrical characteristics, enabling the choice of technically and economically optimized sections for each specific project. U type sheet piles are U type profiles with interlock at both sides to form the continuous walls,which has center lines in the middle of the double U section wall. U profile sheet piles can stack more stable than any other shapes,so can be used both in permanent and temporary projects. Millions of tons of U-shaped hot rolled sheet piles have been used all over the world for all kind of structures for more than 100 years.U profile sheet pilingwas the tradition, especially in Aisa. Ø symmetrical form of single elements resulting in great aptitude for re-use. Note: For Asia hot rolled U type sheet pile, most frequently mentioned brand is FSP, NSP, SKSP, JFESP, all mean same sizes. Hot rolled sheet pile is the tradition of steel sheet pile for over 100 years. This planet consumes over 3 million tons of hot rolled sheet piling every year for permanent projects, and over 1 million tons for temporary projects. Also every years, there are million tons of hot rolled sheet piling rusting. 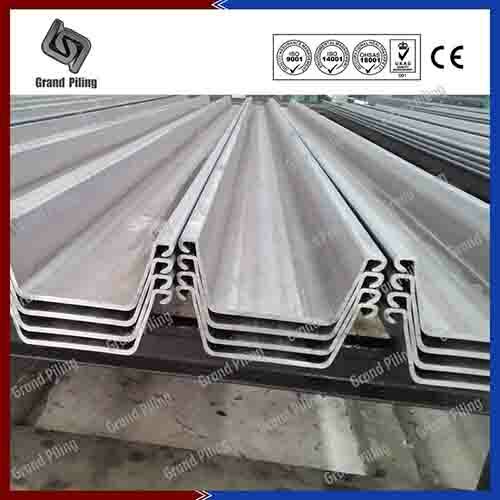 So Hot rolled sheet pile is a big business, only after H beams. A decade ago, all hot rolled sheet piles were produced in Europe, Japan, UK, USA, etc developed countries. And were called Larssen sheet piles. Now China hot rolled sheet pile start to pour into the market. On the market, there are only several famous names which all sheet piling contractors can name: AZ sheet pile, AU sheet pile, PU sheet pile, GU sheet pile, FSP sheet pile, PZ sheet pile, PZC sheet pile, ASTM sheet pile, Larssen sheet pile, Hoesch sheet pile etc. The most important index for steel sheet piles is modulus of section. When hot rolled steel sheet piling from different supplier or manufacturer has similar modulus of section, then these sections can replace each other. 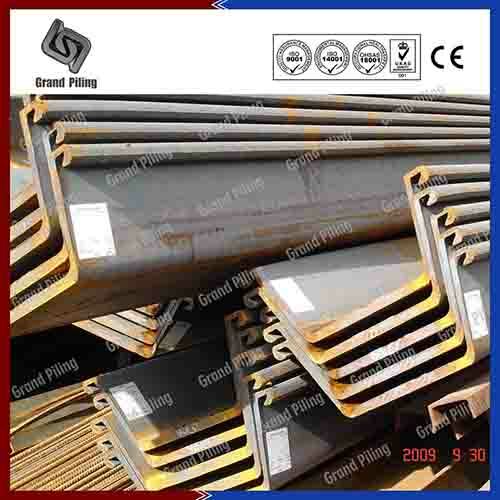 Thickness and steel grade is also important for steel sheet piling, because the thick the steel is, the profiles can be driven into ground more easily and the service life can be longer. 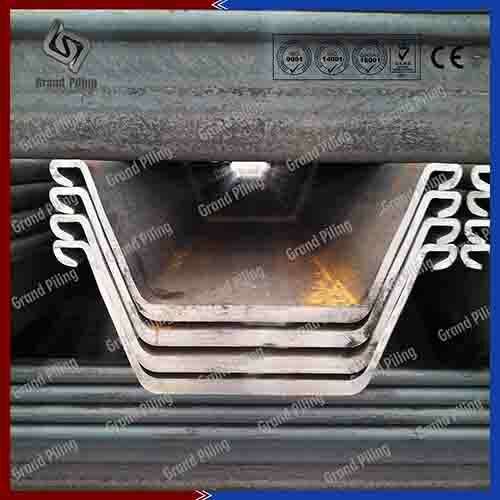 Different steel grade has different corrosion rates, also in different soil conditions, like in polluted or very polluted soils, fresh or salt water, all different. A corrosion rate chart can be obtained easily from China sheet pile. Hot rolled steel sheet pile forms its shape from the molten iron. The usual finish is mill finish, which is light scale on small stuff and heavy scale on thick stuff. With interlocks at both ends, more sections form a continuous sheet piling wall, which is a rigid barrier for earth and water, resisting the lateral pressures. 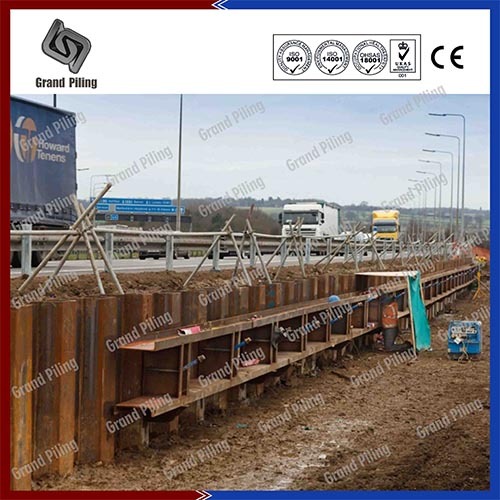 Sheet pile wall provide excellent resistances to bending forces and structural strength to deep foundation. The shape of the section or profile determines the structural strength. China sheet pile can be installed with vibratory hammer, piling rig or drivers, depending on the soils and length and thickness of the profiles. Due to costs considerations, mills or sellers all require a minimum quantity to rolling. Minimum several thousand tons for one rolling (Mills might collect orders of several hundred tons, then until total amount reach their required quantity, they start rolling).There are also different steel grades in different markets: China sheet pile is normally in SY295 SY390. Japan and Korea sheet piles same with China sheet piling. Sheet pile Australia and sheet piling UK are normally S240 GP S355 GP S430 GP etc. Arcelor also have marine grade S460AP for marine usages. In USA, steel grades are ASTM A572 grade 50, grade 60, grade 65 A588 and A690 marine grade sheet piles. Steel sheet piling can be classified into two applications: Temporary and permanent. Permanent steel sheet piles will remain in the ground until contractors think they need to rebuild the projects. It will stay in the places and remain in ground. China sheet piling temporary applications only provide access and safety for constructions in a limited are. After the construction is finished, China sheet piles will be extracted or pulled off and maybe re-sell as second hand steel sheet piles.A big stock of hot rolled sheet piles are here. All profiles can be used as combined walls and available in different steel grades. U type hot rolled sheet piles can be supplied in single pile, double piles, or triple piles. Double piles and triple piles are normally supplied as crimped sheet piles. Threaded doubles piles are recommended for facilitating the installation process. Single piles might bend around the weak axis under driving. While crimping steel sheet piles are more easy to drive and extracted. 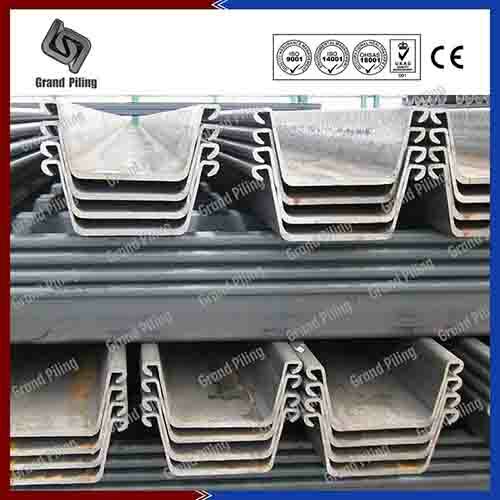 China sheet piling can also supply bent piles. Maximum bending angle is 25 degree. U piles are bent in the middle of the web. Corner sections are needed in almost every in every projects, most widely used sections are C9 corner sections, C14 corner piles. Delta 13 corner piles, Omega 18 clutches. C9 corner piles and C14 corner sections are normally used with tubular combined walls. Special pile or Junction piles are also available upon request. U type steel sheet pile can also form box piles. Two U type sheet piles form double U box pile, for example CAU double box piles, CU double box piles, CPU-R double box sheet pile, CGU double box sheet pile. Three U type sheet piles form triple U box piles, for example CAU triple box sheet pile, CU triple box piles, CPU-R box piles. Four U type sheet piling form quadruple box piles.